TERRECON, Inc. is the pioneer of non-concrete modular pedestrian pavement systems. We believe in elevating the entire pedestrian experience and believe that society should not accept sidewalks that are monolithic, uncomfortable to walk on, dull-looking, cracked, broken, and dangerous — or that require a healthy tree to be removed. 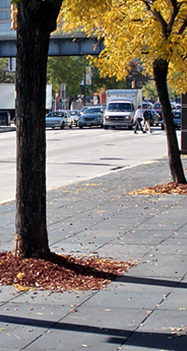 In 2001, we introduced our products as an alternative to chronically broken concrete near trees. Since then, we have extended our position as the leading provider of sidewalks and walkways that are superior to other pavement options in terms of performance, safety, environmental benefits, and cost savings. With installations in more than 200 North American cities including Los Angeles, New York, Seattle, and Washington, D.C., our products are found in municipal and commercial sidewalks; corporate and university campuses; plazas, parks, green roofs, riverfront walkways, museums, residences, and other walkway applications. Reconsider your sidewalks. A better walking experience awaits you, your customers, and your community.